Traditionally, Christmas week is quiet for weddings in Seattle. In Seattle this year (I’ve heard this from wedding planners, too), there has been a tiny “gold rush” of weddings. Congratulations to: John and Ying (Ray’s Boathouse), Catrina and Patrick (Tibbetts Creek Manor), Trisha and Nancy (Beecher’s Loft). Much happiness to: Jim and Sheryl (Bainbridge Island), Emil and Emily (Pike Place Market), Steve and Tara (Fairmont Olympic Hotel), Abdiel and Perla (West Seattle). Blessings for their marriage adventure: William and Pinga (Bellevue), Alex and Sarah (The Willows Lodge), Chris and Aislinn (Palisade) and Ron and Laurie (The Willows Lodge). how wedding dogs Chip and Bear brought so much joy to John and Ying’s wedding ceremony! that I wish Catrina and Patrick lived next door to us on Bainbridge Island. how inspired I am by Trisha and Nancy’s loving relationship. That Jim is one of the most romantic guys on the planet. How Emil and Emily brought down the house at Pike Place Market with their outdoor ceremony. 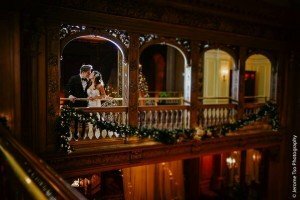 How New Year’s Eve was so festive at the Fairmont Olympic, celebrating Steve and Tara. That William could start a new clothing line of Seahawks wedding apparel! how Alex and Sarah celebrated 10 years together and that puppy, Patrone, looked way too handsome in his tux! That Chris and Aislinn are blessed not only with each other but with their 6 children. And how elegant Ron and Laurie were, surrounded by their children, as they wed.